I grew up in an untidy house full of books, cats and children. My family didn't have a television, so my mother read aloud to us each evening. After I learned to read, I read hundreds of books. The books I liked the best were magical ones like The Hobbit and stories about animals. My brothers and I created stories in the games we played. We dug holes and built forts in the backyard and on "The Hill" across the street. We created worlds for our toys to inhabit and made cities full of paper mice. My friends and I dressed up and put on plays for our families. We pretended the pond in my backyard was the ocean and rowed across it to England in a boat named Pooh. As I grew older, I learned to play with words instead. In high school, I kept a journal and wrote poetry. When I started writing books for children, I discovered I knew a lot about writing already, because of the books I had read and the games I had played as a child. I started writing books one summer while I was in college. After three years of writing stories and having them rejected, my first book, The Ugly Princess, was accepted. All of my books began with an idea that kindled my imagination or demanded my attention. The Ugly Princess began with a dream. I wrote The Dragon Kite after reading one sentence about a thief in Japan who built a giant kite to steal golden dolphins from the roof of a castle. Nessa's Fish and Nessa's Story grew out of research I had done for my novel Arctic Unicorn. Otter Play was inspired by watching otters while kayaking on the Salmon River and canoeing on the Black River. My concern for a wetland called Grass Lake resulted in Squish! A Wetland Walk. Several of my books grew out of my interest in days that people celebrate. I wrote A Gift for Abuelita after a friend introduced me to the Mexican holiday honoring the dead: El Día de los Muertos (The Day of the Dead). Celebrations of Light began when I discovered how people in countries all around the world use light in celebrations. As you can see, I'm interested in a wide range of topics – and I love doing research! One thing I especially enjoyed about writing was watching the seed of an idea – through the hard work and creativity of the writer, illustrator, editor, art director, designer and printer – become a beautiful book. Nancy Luenn grew up in Los Angeles, California. Her family made frequent visits to the zoo and museums. On camping trips to the mountains and deserts, her parents taught her the names of plants and animals, and how to be respectful of the earth. Nancy graduated from The Evergreen State College in Olympia, Washington. While at Evergreen, she pursued her interests in art, education and natural history. She became an avid whitewater kayaker, learned to ski, and lived for a year in a tipi. She is the author of 14 books for children and teenagers, and editor of A Horse's Tale. During her years as a writer, she gave presentations at schools and conferences in Washington, Oregon, Alaska, Australia and Venezuela. Nancy and her husband live on Whidbey Island in Washington State. In her free time, she enjoys reading, gardening, listening to opera, "messing about in boats" and walking on the beach. 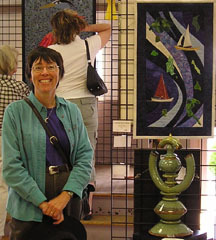 Her current creative expression is making art quilts.